This is a black and white photograph. Doron Swade, Curator of Computing at the Science Museum, is standing to the left of the Babbage Difference Engine No. 2. The engine is about two feet taller than he is. The engine seems to be part of a museum dispaly, and the sticker on the verso speaks of the Science Museum. However, there is no reference to what museum it is. There is a negative number on the verso of the photograph, but part of the number has been marked on with white out. The legible numbers are "10 69/91/8". Written on white paper affixed to verso side of image is "Charles Babbage's Calculating Engine" and "Babbage's Difference Engine No. 2 pictured with Doron Swade (Curator of Computing) who led the engine project. Difference Engine No. 2 was built to original designs at the Science Museum for the bicentenary of Babbage's birth celebrated this year. 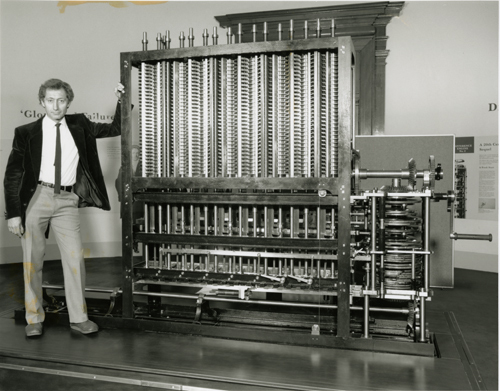 It is the first complete Babbage engine to be realised in physical form. It was designed between 1847 and 1849. It measures 11 ft long, 7 ft high and 18 inches deep, weighs over three tonnes, and consists of 4,000 parts made of bronze, cast iron steel.